After going to bed at midnight with the sun still up on Monday, breakfast was served at 7AM on Tuesday. It was still raining lightly and very overcast as we set out on the jet boats for the Copper River again. 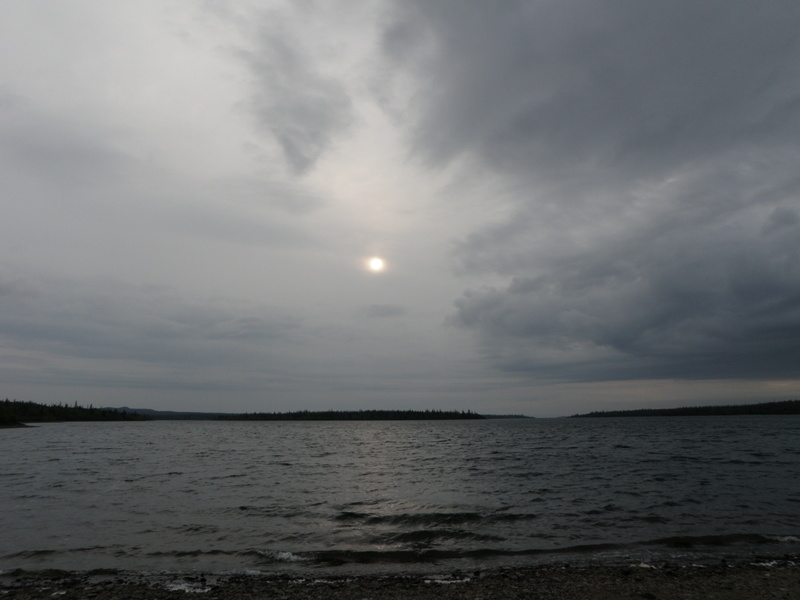 The weather did clear gradually as the day wore on and the sun actually came out in the middle to late afternoon. 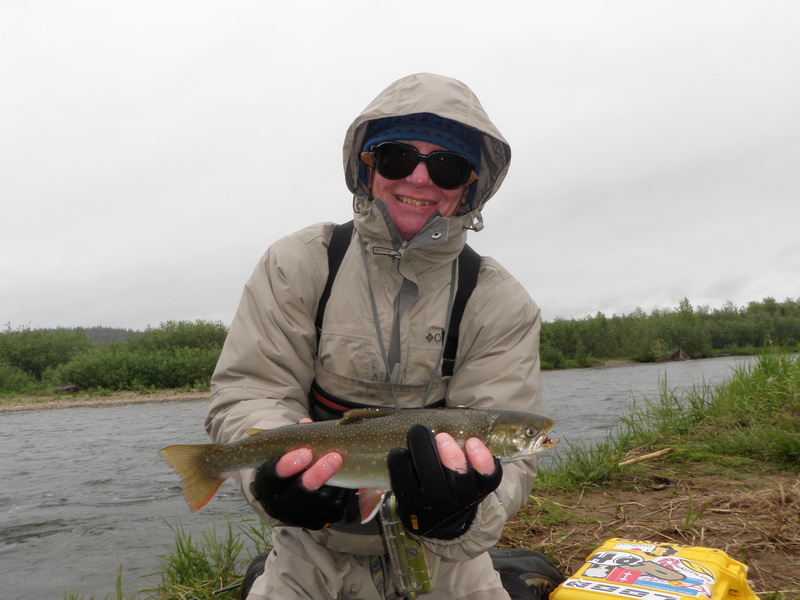 I landed three smaller rainbows before lunch (small by Alaska standards are 12-13 inch fish) as we worked some runs with streamers. 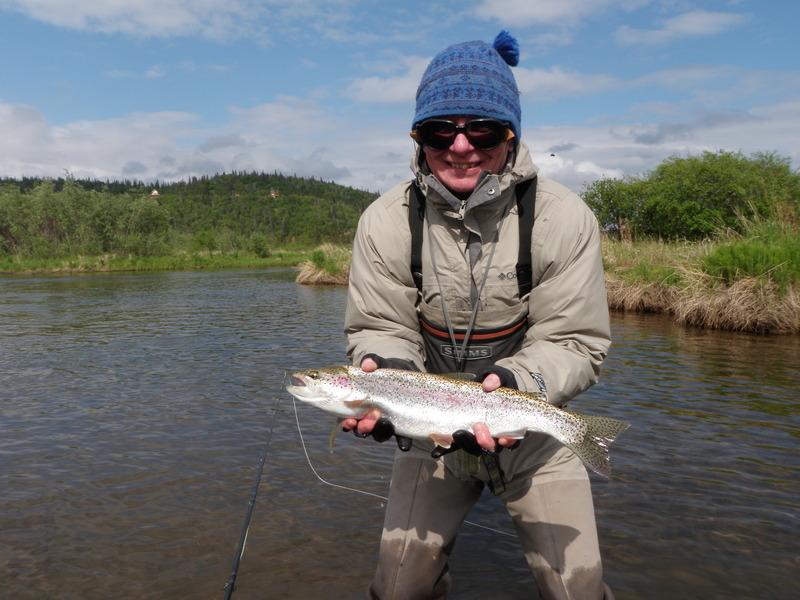 One rainbow took the purple leech and then two took the white marabou flesh fly while I fished the spey rod. After lunch Jordan introduced me to two spots where an eddy was formed below an island. The most productive place was directly across from where we ate lunch where a huge eddy resulted in a backflow along the far bank. I was positioned at the point of a gravel bar where the current swept back and met the main current. Jordan spotted the two Dolly Varden just below our feet where the current dropped off and I managed to land both on the rubber leg pheasant tail and another small pheasant tail with a red thread band behind the bead. Trout were rising sporadically in the eddy as we fished, and there were yellow sallies and caddis in the air along with a few of BWO’s. When some fish began rising deep in the slough by a sunken log, Jordan tied on one of my Letort hoppers and I duped a 16 inch rainbow that I landed. This fulfilled one of my goals of catching a large rainbow on a dry fly. A caddis dry also produced a rainbow in the eddy. The best fish sucked in the small pheasant tail in the riffles formed below me where the eddy and main current merged. This rainbow measured out in excess of 20 inches. 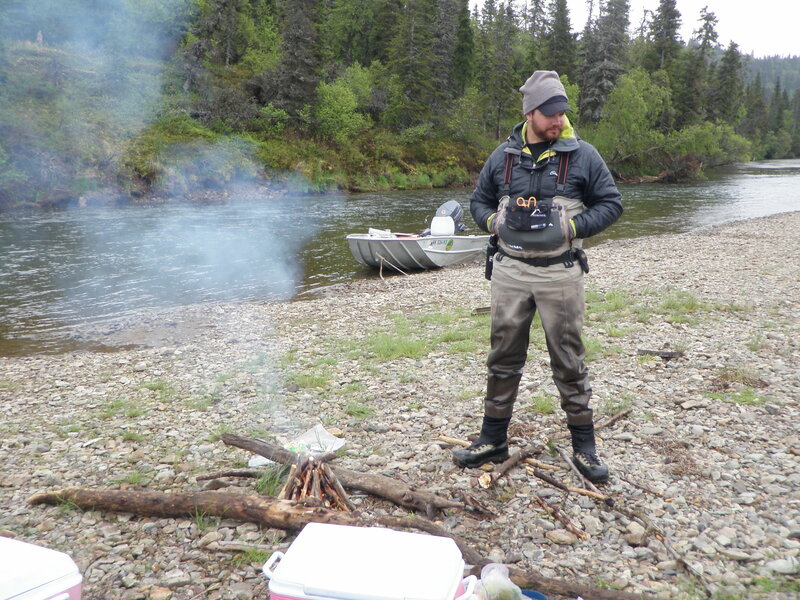 Eventually the rising activity slowed and with it the fish catching ended so we pulled up anchor and moved to a beautiful stretch where a run ran down the center of the river and then swung closer to the far bank. In this area 30 yards of prime fish habitat screamed for nymphs, and that’s exactly what we did. Jordan kept the double pheasant tail nymph combination in place, and using the high stick nymphing technique I landed another three fine rainbows, two in the 20-21 inch range. We called it a day around 6:15 and headed back for a fine dinner prepared by chef Slam.